Leveled items are typically obtained as quest rewards. The item is scaled in power based on the player's level at the time the reward is given. Some leveled items become stronger in both their physical and magical characteristics, while others only improve their enchantments. The items do not improve in quality when your character levels up. Therefore, some players may wish to plan when to complete quests in order to obtain the best items. At level 30, all items should be in their best forms, except for those with bugs in their leveling lists. 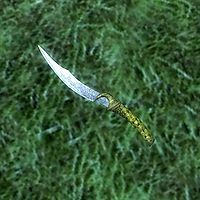 The artifact Blackwater Blade is a one-handed blade, given to the main character by, or looted from, Selene during An Unexpected Voyage. It is similar in appearance to the fine steel longsword, but has a different pattern on the hilt, and also a different icon in the inventory. For full leveled statistics, see the Blackwater Blade article. The Blade of Woe is first given to you by Lucien Lachance when you are invited to join the Dark Brotherhood, but it does not become enchanted until the conclusion of the Honor Thy Mother Dark Brotherhood quest. 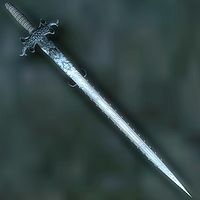 In appearance, it is identical to an ebony dagger. The Blade of Woe can also damage ghosts, wraiths, and other similar enemies even before it is enchanted. For full leveled statistics, see the Blade of Woe article. 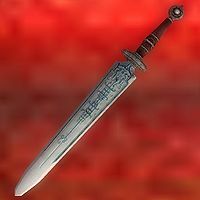 The ice-based artifact Chillrend is a one-handed blade given as a reward for completing the quest The Killing Field, if both sons survived. 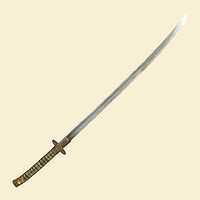 Its appearance is similar to a glass shortsword, although it has a blue hue, slightly smaller grip, and longer blade. For full leveled statistics, see the Chillrend article. The Debaser is found in the Imperial City Palace District during the quest Unfriendly Competition. 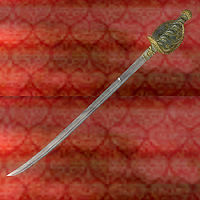 It is similar in shape to a fine steel shortsword, but with darker coloration and engravings; also, its statistics such as speed and reach are those of a longsword, not a shortsword. For full leveled statistics, see the Debaser article. Mishaxhi's Cleaver can be found in Sancre Tor, Hall of Judgement during the Blood of The Divines quest. It is wielded by an Undead Blade. 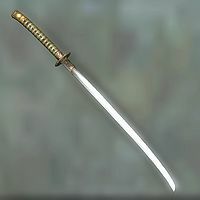 In appearance it is identical to an Akaviri Dai-Katana. For full leveled statistics, see the Mishaxhi's Cleaver article. For full leveled statistics, see the Northwind article. Redwave is given as a reward for completing The Ghost Ship of Anvil quest. In appearance it is identical to a cutlass. 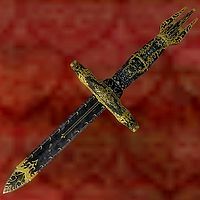 Sufferthorn is a dagger given as a reward for the Dark Brotherhood quest, Accidents Happen. 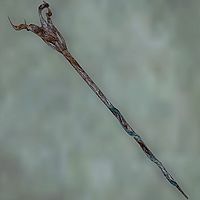 In appearance, it is identical to an elven dagger. For full leveled statistics, see the Sufferthorn article. 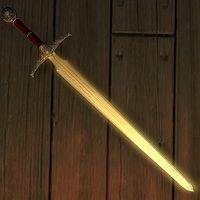 The artifact Thornblade is obtained in Cheydinhal as one of the two choices of rewards for completing The Wayward Knight quest, the other reward being the Staff of Indarys. For full leveled statistics see the Thornblade article. 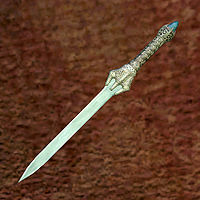 Witsplinter is a dagger used by Faustina Cartia, leader of the Sirens gang in Anvil. You meet Faustina and have an opportunity to acquire Witsplinter during The Siren's Deception quest. 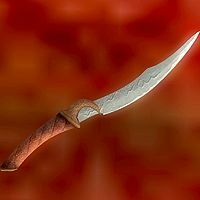 The dagger looks like an Elven dagger but has different markings and engravings, as well as a slightly shorter handle and the gold tint of the handle replaced with red. Its statistics are dependent upon your character's level at the time when you obtain it. For full leveled statistics, see the Witsplinter article. 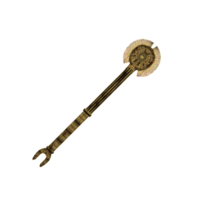 Burz's Glass Mace is used by Burz gro-Khash, leader of the Cheydinhal Fighters Guild. In appearance it is identical to a glass mace. 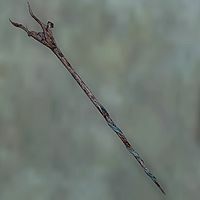 It also bears the distinction of being the only non-enchanted leveled weapon in the game. Acquiring it may be difficult as Burz is an essential character who can't be killed. One option is pickpocketing the mace while he is asleep. For full leveled statistics, see the Burz's Glass Mace article. 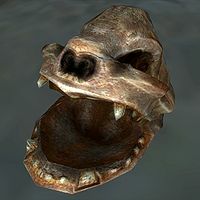 Hatreds Heart is found in Chorrol Oblivion World, also called Random Oblivion World 2; see the Oblivion World entry for details. 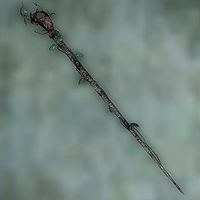 In appearance it is identical to a Daedric mace. For full leveled statistics, see the Hatreds Heart article. Rockshatter is a quest item, so it's weightless when you first get it. The non-quest version (ID listed first) is not weightless, so the number applies to this. For full leveled statistics, see the Rockshatter article. Hatreds Soul is found in the Chorrol Oblivion World, also known as Random Oblivion World 2. 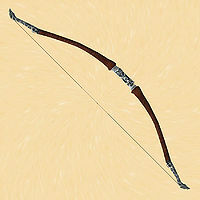 In appearance it is identical to a Daedric bow. It is possible to obtain multiple copies of Hatreds Soul, as described on the Oblivion World page. Combined with Hatreds Soul Arrows, this bow can inflict the most base damage in the game. For full leveled statistics, see the Hatreds Soul article. Shadowhunt is a bow that is given as a reward for the Dark Brotherhood quest, The Lonely Wanderer. In appearance it is identical to a steel bow. For full leveled statistics, see the Shadowhunt article. The Apron of Adroitness is given as a reward for completing the quest A Brush with Death. 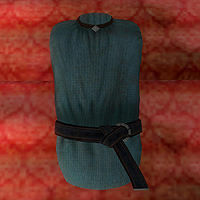 For full leveled statistics, see the Apron of Adroitness article. Kvatch Cuirass is given as a reward for completing The Battle for Castle Kvatch. 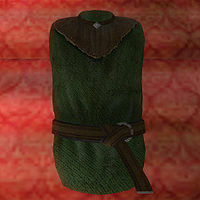 The regular, unenchanted cuirass worn by the Kvatch guards is also identified as a "Kvatch Cuirass", and is identical in appearance to the enchanted cuirass. 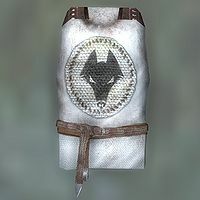 Information on the guard version of the cuirass can be found at Guard Uniforms. For full leveled statistics, see the Kvatch Cuirass article. 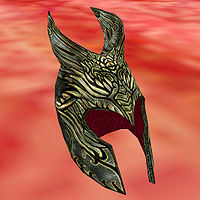 The Ayleid Crown of Lindai is a unique light helmet found in the ruins of Lindai during the Secrets of the Ayleids quest. 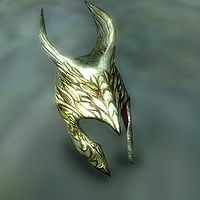 For more information, including full leveled statistics, see the Ayleid Crown of Lindai article. The Ayleid Crown of Nenalata is a light helmet found in Herminia Cinna's house (Imperial City, Elven Gardens District) during the Secrets of the Ayleids quest. For more information, including full leveled statistics, see the Ayleid Crown of Nenalata article. 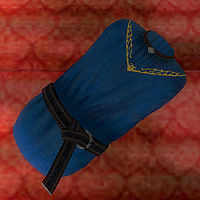 The Bloodworm Helm is a leveled light helmet encountered during The Bloodworm Helm quest in the Mages Guild questline. It must be given up after the quest and cannot subsequently be retrieved. The level 1-4 helm also allows you to cast the apprentice-level version of the Essence Drain spell when wearing the helm. For full leveled statistics, see the Bloodworm Helm article. 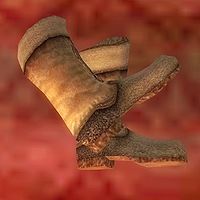 For full leveled statistics, see the Boots of Bloody Bounding article. The Escutcheon of Chorrol is one of the possible rewards for completing the quest Sins of the Father. It closely resembles an ebony shield, but has the Chorrol emblem, the Great Oak, embossed on the front. For full leveled statistics, see the Escutcheon of Chorrol article. Valdemar's Shield is found in Sancre Tor, Prison, wielded by an Undead Blade. For full leveled statistics, see the Valdemar's Shield article. 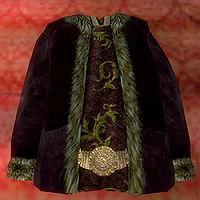 Mankar Camoran's Robes worn by Mankar Camoran, encountered during the Main Quest. In appearance, it is identical to the Arch-Mage's Robes, but it allows any amulet worn by you to be visible. 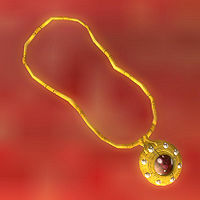 This is to allow the Amulet of Kings to be seen when worn by Camoran. For more information, including full leveled statistics, see the Mankar Camoran's Robe article. Robe of the Apprentice is received for completing all the Recommendation quests (along with access to the Arcane University). 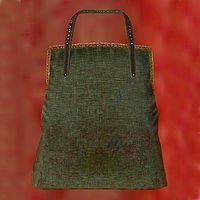 In appearance it is identical to standard green robes. For more information, including full leveled statistics, see the Robe of the Apprentice article. Robe of the Conjurer is a reward for completing the Mages Guild quest Vahtacen's Secret. In appearance it is identical to standard mage's robes. For more information, including full leveled statistics, see the Robe of the Conjurer article. The Deceiver's Finery is given as a reward for the Dark Brotherhood quest Bad Medicine. In appearance, it is identical to a black & burgundy outfit. For more information, including full leveled statistics, see the The Deceiver's Finery article. For more information, including full leveled statistics, see the Amulet of the Ansei article. Amulet of Interrogation is given by Modryn Oreyn after the Information Gathering quest for the Fighters Guild. 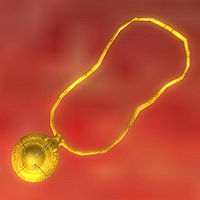 In appearance it is identical to a gold jeweled amulet. 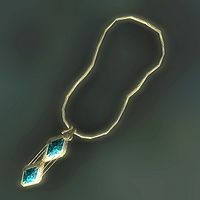 For more information, including full leveled statistics, see the Amulet of Interrogation article. 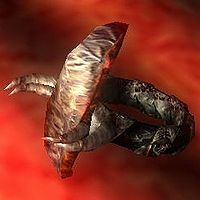 Cruelty's Heart is an amulet given as a reward for the Dark Brotherhood quest The Assassinated Man. 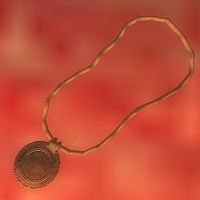 In appearance, it is identical to a jeweled copper amulet. For more information, including full leveled statistics, see the Cruelty's Heart article. 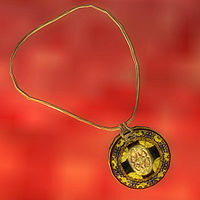 The Knights of the Thorn Medallion is an enchanted item worn by members of the Knights of the Thorn. You receive one as a reward for completing The Wayward Knight quest in Cheydinhal. In addition, all living members of the faction have a medallion (specifically, Jhared Strongblade, Bremman Senyan, and Farwil Indarys). Pyke in the Shivering Isles also had a medallion, but he has lost it and asks the you to retrieve it for him. Oddly enough, none of the dead members have the medallion. For more information, including full leveled statistics, see the Knights of the Thorn Medallion article. 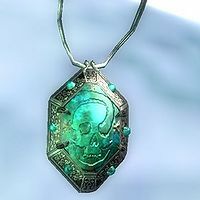 The Necromancer's Amulet is encountered during The Necromancer's Amulet quest, but it must be given up at the end of the quest and cannot subsequently be retrieved. 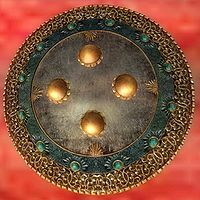 It is an artifact that has appeared in previous Elder Scrolls games. For more information, including full leveled statistics, see the Necromancer's Amulet article. Phylactery of Litheness is given as reward for completing the A Brotherhood Betrayed quest in Bruma. 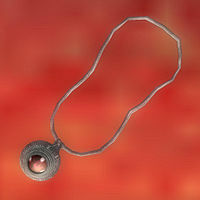 In appearance it is identical to a jeweled silver amulet. The Phylactery of Litheness is the true nature of the Mundane Amulet. For more information, including full leveled statistics, see the Phylactery of Litheness article. The Spelldrinker Amulet is given on advancement to the Evoker rank after completing the Mages Guild quest Ulterior Motives. For more information, including full leveled statistics, see the Spelldrinker Amulet article. Black Band is given as reward for the Dark Brotherhood quest A Watery Grave. 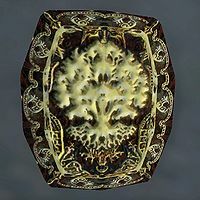 In appearance, it is identical to most enchanted brass rings. For full leveled statistics see the Black Band article. Mind and Body Ring is a reward for completing the Fighters Guild quest Mystery at Harlun's Watch. In appearance it is identical to most enchanted brass rings. For full leveled statistics see the Mind and Body Ring article. The Ring of Eidolon's Edge is given as reward for the Leyawiin side quest Whom Gods Annoy. For full leveled statistics see the Ring of Eidolon's Edge article. 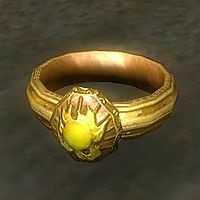 The Ring of Sunfire is a leveled ring obtained as a reward for completing the Imperial City quest The Order of the Virtuous Blood. It provides protection against both disease and spells. For full leveled statistics, see the Ring of Sunfire article. 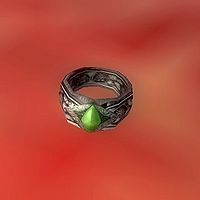 This Ring of the Vipereye is an Akaviri artifact given as a reward for completing the Bruma quest Lifting the Vale. It was originally found with the diary of an Akaviri messenger sent to Pale Pass. In appearance, it is identical to a silver emerald ring. For full leveled statistics see the Ring of the Vipereye article. 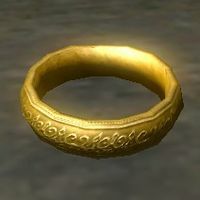 Weatherward Circlet is a ring given as a reward for the quest Unfriendly Competition. For full leveled statistics see the Weatherward Circlet article.